Perfect for creating unique scrapbook layouts and home decor projects. This 12 x 12 sheet can be cut with scissors, used with a Sizzix, Accu Cut & So much more!! Create your own one of a kind shapes with this product!! *WHOLESALE ACCTS:MUST BUY IN UNITS OF 25* Super sticky 1.0" circle stickers. Great for binding and project together. Come 4 disc to a strip. Each package includes 5 strips for a total of 20 disc. Paws cutout page (1 cutout & 1 blank pages)-1/8" Birch wood cards/mini pages. These wood cards can be used either as a card or as a front and back cover to a mini album. 2 pieces per pack, approximate size 3.75"x5.75". Use a drill or Crop-A-Dile to punch holes if desired. Paint, stain, paper and add embellishments to these one of a kind designs.Comes with 2 pre-drilled side holes. Proud to be made in the USA Send it Clear Belgrave card comes with 3 clear pieces, binding stickers and 1 clear envelope. Card measures 4.25 inches x 6.0 inches. Each cards comes with a protective film that need to be removed before decorating. All Clear Scraps acrylics are crystal clear once film is removed. Send it Clear Deco card comes with 3 clear pieces, binding stickers and 1 clear envelope. Card measures 4.25 inches x 6.0 inches. Each cards comes with a protective film that need to be removed before decorating. All Clear Scraps acrylics are crystal clear once film is removed. Send it Clear Regular card comes with 3 clear pieces, binding stickers and 1 clear envelope. Card measures 4.25 inches x 6.0 inches. Each cards comes with a protective film that need to be removed before decorating. All Clear Scraps acrylics are crystal clear once film is removed. Send it Clear Scallop card comes with 3 clear pieces, binding stickers and 1 clear envelope. Card measures 4.25 inches x 6.0 inches. Each cards comes with a protective film that need to be removed before decorating. All Clear Scraps acrylics are crystal clear once film is removed. Send it Clear Fancy card comes with 3 clear pieces, binding stickers and 1 clear envelope. Card measures 4.25 inches x 6.0 inches. Each cards comes with a protective film that need to be removed before decorating. All Clear Scraps acrylics are crystal clear once film is removed. Send it Clear X-Tree card comes with 3 clear pieces, binding stickers and 1 clear envelope. Card measures 4.25 inches x 6.0 inches. Each cards comes with a protective film that need to be removed before decorating. All Clear Scraps acrylics are crystal clear once film is removed. Send it Clear Heart card comes with 3 clear pieces, binding stickers and 1 clear envelope. Card measures 4.25 inches x 6.0 inches. Each cards comes with a protective film that need to be removed before decorating. All Clear Scraps acrylics are crystal clear once film is removed. Send it Clear Cupcake card comes with 3 clear pieces, binding stickers and 1 clear envelope. Card measures 4.25 inches x 6.0 inches. Each cards comes with a protective film that need to be removed before decorating. All Clear Scraps acrylics are crystal clear once film is removed. Send it Clear Bell card comes with 3 clear pieces, binding stickers and 1 clear envelope. Card measures 4.25 inches x 6.0 inches. Each cards comes with a protective film that need to be removed before decorating. All Clear Scraps acrylics are crystal clear once film is removed. Send it Clear Butterfly card comes with 3 clear pieces, binding stickers and 1 clear envelope. Card measures 4.25 inches x 6.0 inches. Each cards comes with a protective film that need to be removed before decorating. All Clear Scraps acrylics are crystal clear once film is removed. Send it Clear Angel card comes with 3 clear pieces, binding stickers and 1 clear envelope. Card measures 4.25 inches x 6.0 inches. Each cards comes with a protective film that need to be removed before decorating. All Clear Scraps acrylics are crystal clear once film is removed. 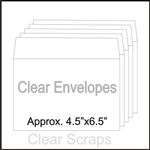 Send it Clear lock card comes with 3 clear pieces, binding stickers and 1 clear envelope. Card measures 4.25 inches x 6.0 inches. Each cards comes with a protective film that need to be removed before decorating. All Clear Scraps acrylics are crystal clear once film is removed. Send it Clear Half Scallop card comes with 3 clear pieces, binding stickers and 1 clear envelope. Card measures 4.25 inches x 6.0 inches. Each cards comes with a protective film that need to be removed before decorating. All Clear Scraps acrylics are crystal clear once film is removed. Send it Clear Ornate card comes with 3 clear pieces, binding stickers and 1 clear envelope. Card measures 4.25 inches x 6.0 inches. Each cards comes with a protective film that need to be removed before decorating. All Clear Scraps acrylics are crystal clear once film is removed. Send it Clear Half Fancy card comes with 3 clear pieces, binding stickers and 1 clear envelope. Card measures 4.25 inches x 6.0 inches. Each cards comes with a protective film that need to be removed before decorating. All Clear Scraps acrylics are crystal clear once film is removed. Buy 5 sheets and get 1 sheet FREE Perfect for creating unique scrapbook layouts and home decor projects. This 12 x 12 sheet can be cut with scissors, used with a Sizzix, Accu Cut & So much more!! Create your own one of a kind shapes with this product! !